Bananas foster mix: Add all ingredients except 1 banana and thoroughly mix with the hand held blender until it is well combined and uniform. Batter: Whip eggs and sugar with a whisk. Add vanilla and whisk until sugar has completely dissolved. Continue to whisk while adding the half-and-half. Sauce: In a hot pot over medium heat, melt butter and brown sugar with the vanilla. Wait until butter is completely melted. Remove pan from the heat, add the rum and ignite with a long kitchen match. When the flames die down, add the cream immediately and whisk vigorously until sauce is completely smooth. Assembly: Heat some oil in a large saute pan. Stuff 4 quarters of hinged French bread, with the reserved sliced banana, and top with the cream cheese stuffing. Slice the 4 portions of filled bread into 4 diagonal pieces, dip into the batter and pan-fry on all sides until golden brown. Pour the warm rum sauce on a plate. 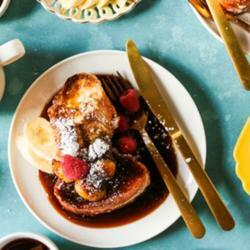 Place the golden pieces of toast on top and garnish with powered sugar.